The first DLC was released on 1st December 2009, called the '''Team Racing Pack''', featuring five new cars and a patch was recently released as well. 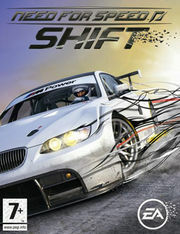 The second DLC was released on 16th February 2010, entitled '''Ferrari Racing Pack''', exclusive to the Xbox 360 and at a price of 800 Microsoft Points or $10.00. It marks the return of Ferrari vehicles for the first time in the series since 2002's [[Need for Speed Hot Pursuit 2|Hot Pursuit 2]].